The Teryei Solar Charger holds the number 3 spot in our top 10 best portable solar chargers list. It has a 4.5 rating on Amazon.com, as well as a badge for "#1 Best Seller in Cell Phone Solar Chargers". Let's see what all the hype is about. The Teryei solar charger is an outdoors man's best friend. It is durable, reliable, powerful, and has a bunch of great survival features. Not to mention it is crazy portable. It sizes at 5.5 x 0.8 x 3.1 inches. Roughly the same size as a smartphone, and about the same weight, 11.3 ounces. That is not even a pound, making it very lightweight. In this small body design, you can expect to find some huge power. The Teryei solar charger comes equipped with a massive 15000mAh lithium battery. The power bank battery can be charged by either the sun, or by plugging it into a wall outlet. By using a DC input, it should only take between 6 and 8 hours for the bank to completely charge. That is pretty fast for the size of the battery. And that battery is not just for show. It is as powerful as it is huge. Results from various testing has shown that it can charge an iPhone 7 completely for up to 7 times, as well as the Galaxy S7. In addition, the Teryei solar charger features dual USB ports which each max out at 5V/2.1A. Meaning, like many other solar chargers, you can freely charge two devices at once without sacrificing power. And, of course, the dual USB ports support all quick charge technology. This is a must have, because waiting for your phone to charge at a turtle's pace can be mind numbing. To determine the charging level, pilot lights are located across the top of the charger. Of course, the real reason we are talking about this thing is because it is a solar charger. However, some devices are more power bank than solar chargers. The Teryei solar charger is not one of those devices. While it is suggested the power bank be charged using a DC input, the solar panels are still very capable. They max out at 5.5V, which is .5 higher than the DC input and have a conversion rate of 260mAh. Now of course, with the size of the battery, it might take longer than the 6-8 hours of DC to completely charge the power bank. But the solar panels will do their job very well, given good sunlight conditions. You can even place it under a lamp to take advantage of the solar panels. The efficiency might be lower but that is to be expected. The outer body is where the Teryei solar charger truly shines. This thing can take some serious punishment. It is made out of ABS, PC, and eco-friendly silicone. Throw it in the water, drop it on the rocky ground or in the dirt, it can handle it. The casing also features a close-able door which covers the charging ports. Nothing will be getting into the mechanics of this charger. In addition, carabiner hook is located on the top corner, allowing you to securely latch it on your backpack when hiking or even your belt loop on your pants. Wherever you want. Another awesome thing about the Teryei solar charger are the added features, perfect for if you get lost in the wilderness. It features both a compass on the back and dual LED flashlights at the bottom. The flashlights have multiple modes. Max brightness, low brightness, strobe, and SOS Morse code. Barely anything can be found about this company. This may be a red flag for some people, however when shopping on Amazon, it tends to be a common occurrence. From what I could find, their trademark was registered in January of 2017. The name Teryei is owned by Shenzhen Xiaochi Network Technology Co.,Ltd, based out of Shenzhen, China. They specialize mostly in electronics and electronic accessories. The company as a whole has a 93% positive rating on Amazon in the last 12 months, from over 200 individual reviews and ratings. People seem to love their products. The Teryei Solar Charger is a small case of raw power. It's 15000mAh lithium battery makes for a huge power capacity. Super compact and lightweight. Does not even weigh a pound. You can easily fit it in a pocket or your backpack. In addition, the solar charger features a metal hook that allows for secure fastening to the outside of a backpack. If you are reckless with your stuff, fear not. The Teryei solar charger is super durable. The casing is shockproof, waterproof and dirt/dust proof. Super fast charging of the power bank. Charging with a DC input of 2.1A will completely charge the power bank in 6 to 8 hours. Charging with the solar cell, while slower, is still capable. Dual USB charging ports that max out at 5V/2.1A make for fast and reliable charging. Plus, due to its power capacity, it can completely charge your device multiple times from one power bank charge. Decent solar cell conversion of 260mAh. It also maxes out at 5.5V which is actually better than the DC ports of 5V. If you get lost, this solar charger might be able to help you. It is equipped with dual LED flashlights that have 4 modes of light, as well as a compass on the back. Simple LED pilot lights across the top make for easy gauge of current power level. While the solar cell is better than some of the others we have reviewed, it still could be better. The company still recommends using DC power as its main source of power. Durability, a small design and a big battery make for a pretty great power bank. Plus, the solar cell conversion rate is decent enough to keep your devices powered throughout the day. If you have a tendency of getting lost, this may be the perfect solar charger for you. The adjustable flashlights and handy dandy compass may just save your life. 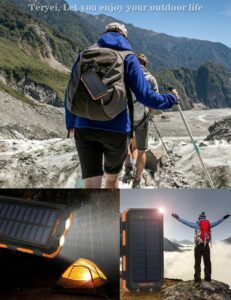 If you are a fan of hiking, river rafting, camping, or really any outdoor activity where you may get lost, this is the solar charger for you. It is crazy durable and portable. It can also be securely attached right to your backpack for solar charging on the go. Right now, you can find it on Amazon for $23.99. For any more information about solar technology, check out the rest of Green and Growing. Here are some top questions that I found for people seriously considering buying the Teryei Solar Charger. What kind of devices can this charge? Anything that is charged by a USB can be charged by this solar charger. Will this power bank hold up to the elements? This solar charger is waterproof, shockproof, and dustproof. To be safe, do not go throwing it around. What if I want to go full solar? While the solar cell is capable, the charging time is still very slow. If you want to go full solar power, choose a pure solar charger and not a solar power bank.